The momentum resumes. Or some of it, anyway, with Jupiter leading the way. Here’s a fresh update on the ‘great benefic’, the Keepers of the Flame, and the Phoenixing Mission … for those who choose to dive in and rise to the occasion. Featured Image Credit: Mosaic featuring the Phoenix, in the ancient Roman city of Aquileia, Italy. Public domain image courtesy of Wikimedia. Ready to Phoenix? Rise and Shine, Your Way. For Soul Force-stirring Phoenix Clues, epiphanies, and greater clarity on what has joy, heart, and meaning for you (and how to step into and express that), team with me as your inspiration partner, mentor, and guide. 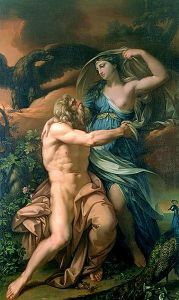 Jupiter and Juno, by Gavin Hamilton (1723-1798). Pubic domain image due to date prior to copyright term. As Jupiter continues to emanate its expanding archetypal-energy essence from the earthy-Feminine Virgoan fields,we may find remedy for what ails us (and culture) in the authentic service of the ‘my cup overfloweth’ variety. Or by Phoenixing, but more on that in a bit. It’s a fine time to re-feature this rather dry-witted, Saturnian insight from Jung on Separating from the Herd. It’s nicely attuned to this Friday Sagittarius New Moon and new lunar cycle (neatly trined Uranus in Aries, igniting those rebel-sparked ‘fiery arrows’ of stirred-and-centered vision … are you noticing them as they arise? ), and for stirring the vision-cauldron for the months and year ahead. For a few more themes aligned to the current archetype-energies, vision-quest impulses, and possibilities stirring around and within us, check out the recent post and the insightful and ‘co-lucid’ comments, Rebels and Mystic Sells (and related articles that pop up in the links). The Trickster and rebel-system-agitator (Uranus-Prometheus) is afoot, but so is the Master Teacher (Saturn in Sagittarius). Aquarians will recognize the weird, unlikely collaboration of this duo, as Uranus/Prometheus and Saturn are the co-rulers of Aquarius. But at the early cusp of the Aquarian Age, we may all be feeling such stirrings and the agitation of creative friction. Hebe Giving a Drink to Jupiter, 1767, by Gavin Hamilton. Public domain image (date precedes copyright). Together, Uranus and Saturn are now holding the torch to illuminate and spark the fiery arrows of the vision quest we’ll undertake in the coming months and year, and to transmute … that’d be reduce to ash … the energy of the calcified beliefs or ‘cultural norms’ that are past their expiry date and have gone sour, rancid, or downright toxic. • What purpose clues, vision stirrings, and far-off-horizons call to you? • Where will you aim your ‘fiery arrows’ for the coming vision quest journey? • How will your Phoenix rise over the coming year? To gain fresh clarity & spark a sense of momentum — schedule a “Commit to Progress” coaching trio or consultation series. 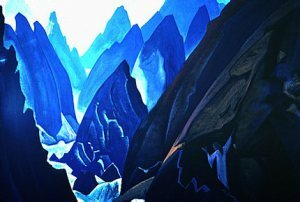 In ‘The Path’, by Nicholas Roerich (1874-1947), the artist depicted his own arduous journey through the Himalayas, and also symbolized the ‘Narrow Path’ taken by true spiritual journeyers. This is what, in the Hero and Heroine’s Journey, is known as answering the call, which takes the journeyer or heroine, “out of the society that would have protected them, and into the dark forest, into the world of fire, of original experience,” as Joseph Campbell mused.